"These are very delicious pancakes and my family loves them." Preheat a skillet over medium heat. Combine all ingredients in a blender. Puree until smooth. Pour batter onto the griddle, to form 5 pancakes. Flip pancakes when edges appear to harden. Cook pancakes on other side for same amount of time until golden brown. 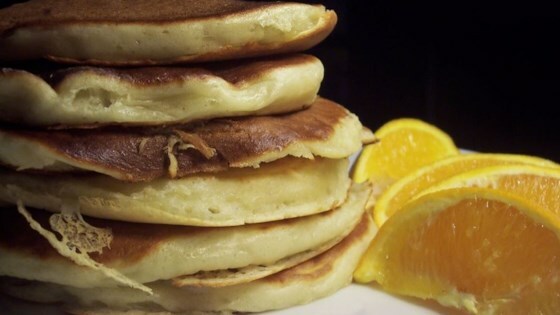 Light, fluffy, everything a pancake should be - I cut the sugar down to 2 Tbsp., added 1 tsp. of vanilla, and used 2 Tbsp. of melted butter vs. 1/4 c. of vegetable oil. These pancakes are good but the recipe calls for to much sugar. Next time I will halve the sugar. I used a 50 percent all purpose flour to 50 percent buckwheat flour. Excellent! I used a mixer b/c I don't have a blender and they were still light and fluffy. Be careful when cooking, they burn easily. Cook on medium heat.